NEW YORK, November 5, 2015 — Instinctive, a leading content syndication firm, today announced the release of a new case study from Nielsen entitled Seamlessly Driving Awareness. 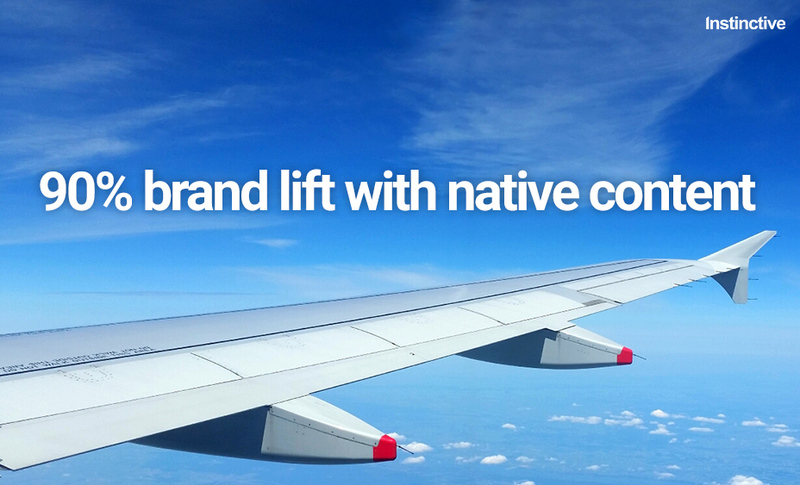 The case study analyzed the brand lift performance of one Instinctive native advertising campaign executed for a large consumer electronics brand and measured in real-time with Nielsen Digital Brand Effect. Upon completion, the study demonstrated that the campaign was one of Instinctive's most successful to date, having achieved a nearly 90 percent increase in brand lift for the new electronic product. With consumers becoming ad-savvy and adjusting their browsing habits accordingly, brands have begun to experiment with more organic advertising alternatives such as native advertising. Native advertising allows brands to create non-disruptive ads that fit the look and feel of the sites on which they are placed. Though powerful, native advertising presents some challenges for marketers, the greatest of which is measurement. To accurately measure the results of its native advertising campaign – and hence provide lucrative results to their client – Instinctive turned to Nielsen Digital Brand Effect. By allowing Nielsen to collect and analyze campaign data in real-time, Instinctive gained the ability to fine-tune their efforts as the campaign progressed. This real-time measurement and fine-tuning contributed to one of Instinctive's best performing campaigns to date. "Native advertising can be a very effective tool to positively influence brand opinion," said Todd Budin, SVP of Product Leadership at Nielsen. "However, without measurement, advertising dollars could easily be wasted. Nielsen Digital Brand Effect helps clients like Instinctive identify and optimize toward the most effective campaign elements to generate successful campaigns for their clients." The campaign's success also hinged on the powerful storytelling platform offered by Instinctive's native advertising format. Rather than impose an advertising format onto a web property, Instinctive’s ads are designed to seamlessly and contextually blend into a publisher’s existing look and feel. This often takes the form of sponsored stories, which can appear in-feed, as a sidebar or as an end-cap. Audiences who engage with the ads will do so within the same publisher web property rather than be re-directed to another site or landing page. Instinctive also applies these same principles to its video ad units. "Measuring brand lift has really helped our business complete the picture in how content works," said Instinctive Co-Founder and CEO Mani Gandham. "Content marketing is about influencing consumers by providing targeted content. Being able to measure how consumers feel toward a brand or product goes a long way towards providing a holistic report of campaign effectiveness for our clients." The full study is available on Nielsen's website.